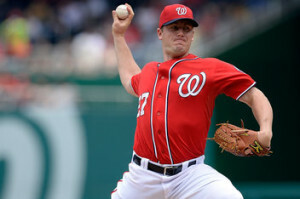 Jordan Zimmermann turned in a dominant performance for the Washington Nationals on Sunday afternoon, leading the way in a 7-0 shutout victory over the Minnesota Twins. Zimmermann went seven scoreless innings, surrendering just two hits and striking out eight batters while walking two. The Washington starter garnered his ninth victory of the season, improving to a 9-3 record and 2.00 ERA, along with a strong 61/13 strikeout to walk ratio in 94.2 innings of work. Zimmermann has blossomed into one of the best starting pitchers in the National League this season, ranking amongst the league leaders in multiple statistical categories. The flamethrowing starter leads the league in WHIP at 0.89 and is tied for the lead with nine victories. Zimmermann is also third in innings pitched (94.2), fourth in ERA (2.00), and is tied for the lead in complete games (3) with Cardinals ace Adam Wainwright. Washington’s star hurler has pitched past the seventh inning in 10 of his 13 starts this season and has never had to throw more than 111 pitches in a single outing (which he did on Sunday). In regards to his efficiency and steadfast consistency on the mound, fellow teammates and coaches point to his “ice-veined” approach to pitching. Zimmermann received solid offensive run support, something he has not comfortably enjoyed throughout the season. Washington’s seven runs were capped by a five-run fifth inning, led by a two-run single by Ian Desmond and two-run double by Anthony Rendon. With the victory, the Nationals are one game away from the .500 mark, holding onto a 30-31 record. Washington sits second in the NL East standings, half a game ahead of the Philadelphia Phillies and 7 1/2 games back of the division leading Atlanta Braves.